Ooo … this bar smells so refreshing. I was able to create this batch on Sunday morning and I took it out of the mold yesterday. 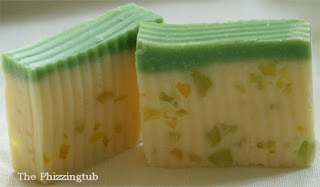 This was the first time I tried to mix in some melt and pour cut ups into the raw soap. I had quite a bit of time to work with the soap before I had to place it in the mold (quite nice) and the green colorant mixed in easy peasy. I have to say I am really happy with how this bar turned out. This bar was made from (not in this order) Olive Oil, Rice Bran Oil, Shea Butter, Cocoa Butter, Palm Kernel Flakes, Palm Oil and Coconut Oil. These beauties were the cut-ups that were tossed into the soap.